The first meal of the day is the most important to set you off on the right foot. Your body has been empty for hours and it needs the right nourishment – which is why you should provide the nutrients it needs. That is never the sugar stuffed cereals which most tend to grab (including me for years!). It is essential to also have a breakfast which keeps you full and satisfied during your busy morning, not an initial sugar high and a slump soon after. The problem is most of our traditional brekki options are packed with fructose: jam on toast, fruit yoghurt with granola, banana muffins, smoothies, even the healthiest looking of cereals (innocent bran flakes have 22g sugar per 100g…). And its even more difficult to find healthy breakfast on the run (step away from the cereal bar rammed with dried fruit and sugar syrup!). I want to provide some fructose-free delicious ideas and recipes to keep you satisfied whether it’s a grab-and-go before work or a full blown brunch. Now I will add a few recipes throughout the next few weeks (as I eat! ), so keep checking back sugar-free friends. Hangover central: the quintessential fry up – fried bacon, eggs, mushrooms, bread, sausages, hash browns (no beans!). Not healthy, but sometimes you just NEED it. 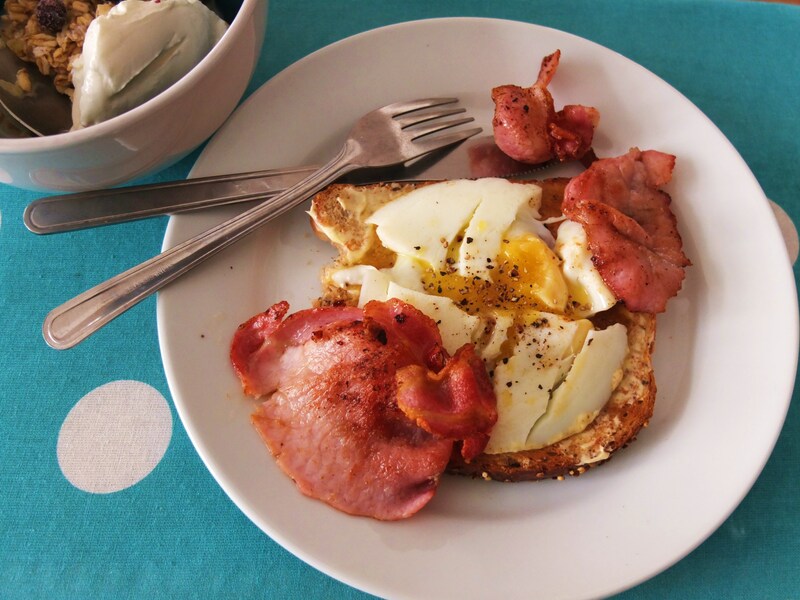 Obviously this is just a basic list – don’t let me restrict you brekkie antics! Just remember a few key rules: if it is atificially colourful (think fruit loops), has a shiny glaze, is covered in syrup, has lots of dried fruit or is basically a cake (think muffin) then DROP IT! Have adopted the porridge to my morning breakfast and so far so good! Not only does it have all the health benefits but the cost is so much better than alternatives.